February 2018: Smart remained the top-selling electric car brand in Germany with the Smart Fortwo again Germany’s favorite electric car model followed by the Renault Zoe and VW e-Golf. January & February 2018: The Smart Fortwo was the best-selling electric car model in Germany thus far this year with nearly a fifth of the market. The electric VW Golf was second followed by the Renault Zoe and Kia Soul. Smart is also the top-selling electric car brand in Germany with nearly a third of all new electric passenger car registrations in Germany thus far in 2018 being an electric Smart. Volkswagen had a 20% share of the German electric car market followed by Renault, Kia and BMW. New electric passenger vehicle registrations in Germany in February 2018 increased to 2,546 cars – a thousand cars more than in February 2017. However, with the total German new car market expanding to 261,749 cars, electric cars had a share of only 0.97%. During the first two months of 2018, electric car registrations in Germany increased to 5,310 cars compared to 2,869 in 2017. Electric cars had a market share of only 0.99% of the total 531,178 sold in Germany thus far in 2018. The overall numbers of electric car sales in Germany remain relatively small. The market is also affected by supply problems with several popular electric car models. Model changes of some popular models are also causing delays in deliveries. Note that the data is for passenger vehicles registered for the first time as electric cars for use on public roads in Germany and thus may include research vehicles or other cars not actually on sale to the public. Smart was again the top-selling electric car brand in Germany during February 2018 and thus far this year has a market share of nearly a third of the German electric new car market. Volkswagen was the second-largest electric car brand in Germany with its market share of 20% very close to the share VW had of the total German new car market. Renault moved ahead of Kia, which had much weaker sales in February compared to a strong January 2018. Renault’s market share thus far in 2018 is 15% while Kia’s is 10%. BMW sold a similar number of electric cars in both January and February while Hyundai sales were much weaker in February. In contrast, Tesla sales in February 2018 were around three times higher than in January. Opel was the final of the eight brands in Germany to have sold more than hundred electric cars in February 2018. For other brands, electric car numbers in Germany were insignificant. Nissan numbers should improve once the new Nissan Leaf model becomes available. Mercedes Benz and Audi seem to perform better with electric show and PR vehicles than with practical cars available to the public. 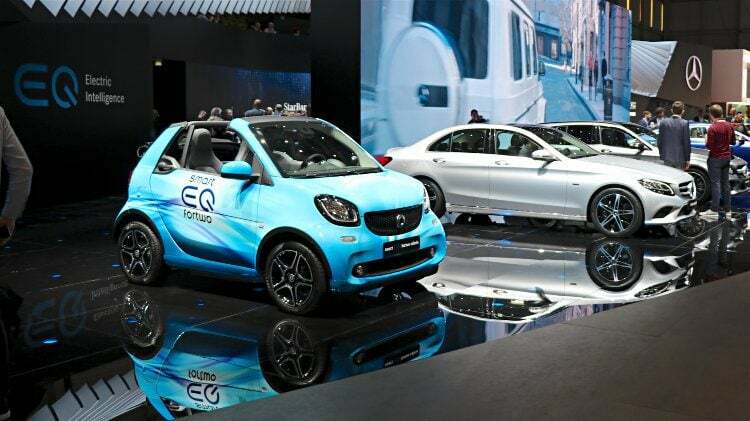 The Smart Fortwo was the top-selling electric car in Germany in February and for the first two months of 2018. The Renault Zoe narrowly outsold the VW e-Golf in February 2018 but the order reversed for the first two months of the year. Strong sales for the Kia Soul in January kept the electric Soul in fourth place thus far this year but in February the South Korean car was only in ninth place. The Smart Forfour improved from seventh in January to fourth in February while the BMW i3 was the fifth best-selling electric car in Germany in both months. Tesla cars performed noticeable better in February compared to January 2018. Sales of both the Model S and Model X more than doubled.